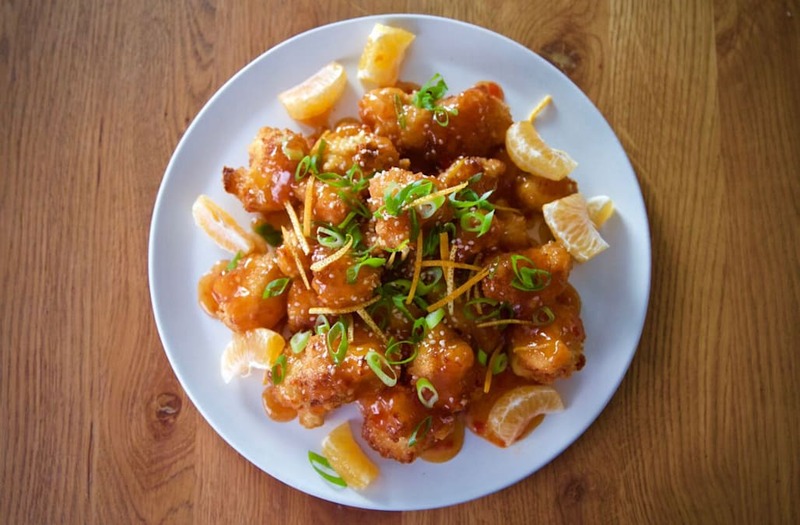 Orange chicken has always been a Chinese food favorite. What's more comforting than biting into sweet and juicy chicken in a citrusy orange sauce? We could eat it everyday if it wasn't so unhealthy! So instead, we've found a delicious and healthy alternative that's even better than the original. Instead of frying the chicken, we're using baked cauliflower and fresh oranges so you get that vitamin C! Next time you're craving takeout, opt for this instead. Crack 2 eggs into a bowl and whisk. Toss cauliflower florets into the egg. Mix and cover the florets with the yolk. In a separate bowl, pour Panko. Scoop egged cauliflower into Panko bowl. Mix cauliflower to coat pieces in breadcrumbs. Spread cauliflower on a baking sheet, and cook for 15-20 minutes at 400 degrees. Pour a cup of water into a pan at medium heat. Pour 1 cup of sugar, a splash of rice vinegar and two splashes of soy sauce. Mix in two cloves of chopped garlic and two tablespoons of chopped ginger. Spice the orange sauce up with a squirt of Sriracha and ketchup. Mix it up and let it come to a low sizzle. In a separate bowl, add 2 tablespoons of cornstarch and 1 cup of water. Stir it up, and add to the boiling orange sauce. Pour it over your deliciously baked cauliflower. Slice off the ends of the orange. Cut into the peel so the orange unravels and peel oranges off the peel. Slice the orange peel into small, thin slices. 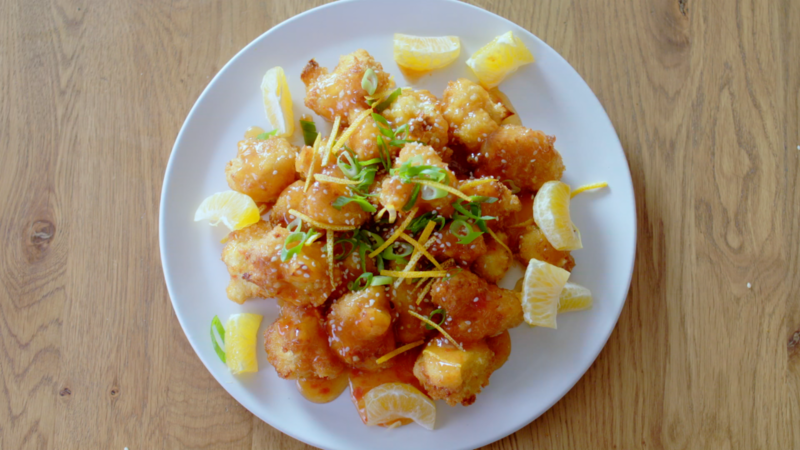 Sprinkle sesame seeds, chopped scallions and orange peel over the cauliflower. Add orange slices on top for even more flavor!